Walkways provide mobility along a linear path. Eventually, people need to cross roads and streets at intersections. These intersections, where the paths of people and vehicles come together, can be the most challenging part of negotiating a pedestrian network. If pedestrians cannot cross the street safely, then mobility is severely limited, access is denied, and walking as a mode of travel is discouraged. 11.5 Crossing and Detection Technology. 11.6 Pedestrian Signal Heads and Half–Signals. 11.7 Curb Extensions and Curb Radii. 11.8 Signal Timing and Pushbuttons. 11.12 References and Additional Resources. In urban areas, two–thirds of pedestrian injuries occur at central business district (CBD) intersections. A suitable example of such injuries is the intersection dash, in which a pedestrian enters the street at an intersection and is seen too late by the driver of a motor vehicle. This is the third most prevalent pedestrian crash type, accounting for 7.2 percent of all pedestrian crashes. Encourage pedestrian use rather than at midblock crossing locations. Make pedestrians as visible as possible. Make pedestrian actions as predictable as possible. A good place to start is to develop design guidelines for intersections that respond to the needs of pedestrians—guidelines that can be followed whenever new intersections are built or when existing intersections are being improved or reconstructed. Table 11–1. Intersection issues for safe pedestrian crossings. Painted crosswalks in the roadway. Extensions to move pedestrians out from behind parked cars (see figure 11–1). Improved horizontal and vertical sight distances through the removal of extraneous curbside clutter (newspaper boxes, redundant utility poles, overgrown vegetation, etc.). Raised intersections to alert drivers that the area is not designed for rapid through movement and pedestrians can be expected. Right–turn slip lanes with exit angles between 50 and 60 degrees. Curb ramps to facilitate the transition from walkways to streets. 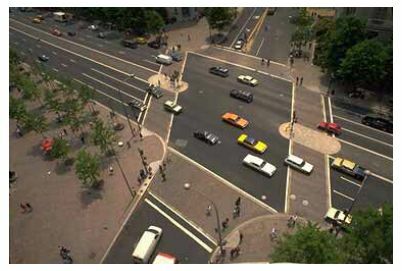 Raised intersections that eliminate the need for curb ramps and make the crosswalk a natural extension of the walkway. Figure 11–1. Photo. Reduced visibility of pedestrians behind parked cars can create conflict. Taking vertical as well as horizontal sight distances into account. Limiting right–turn–on–red movements in areas of high pedestrian volumes. Keeping crosswalks at right angles to turning roadway terminals and slip lanes. Keeping right turns below 24.2 kilometers per hour (km/h) (15 miles per hour (mi/h)) and left turns below 32.2 km/h (20 mi/h). Locating crossing close to the parallel street (0.6 meters (m) (2 feet (ft)) of offset is standard). Using stop bars for motorists and keep stop bars behind crosswalks. Of the 61 different pedestrian crash types, the midblock dart–out type—where a pedestrian may suddenly appear between parked cars or otherwise cross a vehicular way at a random location—accounts for 13.3 percent of all pedestrian crashes. In three–quarters of these cases, the crash occurs in the curbside lane. One–third of midblock dart–outs result in serious injury or fatality. One solution is to create an ongoing retrofit program to establish crosswalks in locations that encourage pedestrians to cross in specific locations and that also provide motorists with a reasonable expectation of where pedestrians might cross a roadway. Crosswalks are one tool that municipalities can use to accomplish both goals. Other tools include curb extensions and medians (discussed later in this lesson). Creating reasonable expectations where pedestrians may cross a roadway. A crosswalk creates a visible indication for both motorists and pedestrians as to where pedestrians may be expected to cross a roadway. Figure 11–2. Photo. Use of colored crosswalks and median refuges makes this intersection more pedestrian–friendly. Knowing when and where crosswalks are appropriate. As noted in the Oregon Bicycle and Pedestrian Plan, some studies have found that pedestrians may develop a false sense of security when crossing a road in marked crosswalks. (5) Other studies have found that motorists are more likely to stop for pedestrians in marked crosswalks, especially where pedestrian right–of–way laws are enforced. Deciding where crosswalks might be located. Generally, marked crosswalks are located at all open legs of signalized intersections. They may also be provided at other locations. When used with curb extensions, signage, and illumination, the visibility of pedestrian crossings can be enhanced. Although expected at intersections, the installation of crosswalks at midblock locations may also be desirable under some conditions, such as when medians or refuge islands are used. ITE recommends that certain conditions may not warrant the installation of marked crosswalks, such as when the hourly peak pedestrian volume is very low (< 25 pedestrians per peak 4 hours) or when traffic volume is very low (<2,000 annual average daily traffic (AADT)). At all other locations, or where predominately young, elderly, or disabled pedestrians may be found, crosswalks are recommended. Develop and adopt a crosswalk policy and design guidelines. Decide where crosswalks shall be used; when policies and ordinances are changed or updated, make sure a crosswalk policy is implemented. Likewise, develop standard crosswalk designs for the public works department to follow. Piggyback on capital and/or maintenance projects. Look for opportunities to install crosswalks whenever intersections are changed or upgraded or when roadways are resurfaced. Use crosswalks to connect sidewalks and curb ramps at intersections. Coordinate crosswalk painting with new or existing curb ramp locations. Establish an annual crosswalk improvement program. Schedule crosswalk replacement or repainting so that crosswalk markings never become deteriorated or less visible to motorists. The duty of a driver to yield right–of–way to a pedestrian in a crosswalk may be compromised if the driver could not see the crosswalk or one did not exist. Furthermore, the municipality may be liable for failing to exercise due care toward maintaining the crosswalk for pedestrians, especially if the municipality knew or should have known of a crosswalk deficiency. Implement a vigorous enforcement program. Convince law enforcement authorities to actively monitor crosswalk behavior, enforce crosswalk laws, and prosecute crosswalk scofflaws. Create and implement a public relations program to increase public awareness about the rights and responsibilities of crosswalk use. Emphasize crosswalk laws through the use of informational signage at crosswalk locations. Crosswalks are relatively inexpensive to install. Obtaining authorization to install them, on the other hand, could take months or longer. An informal traffic study can determine if the crosswalk program is enhancing pedestrian safety. Especially monitor locations of high pedestrian use. Review crash statistics on a regular basis. Place crosswalks across the full width of the pavement. Use crosswalks at all signalized intersections. Use crosswalks at unsignalized intersections with discretion. Place crosswalks in locations where they are visible and where they are not obscured by parked cars or signs. Illuminate midblock crosswalks that are not expected by motorists. Use two white parallel lines 0.2 m to 0.6 m (0.5 ft to 2.0 ft) wide, spaced at a 1.8–m (6–ft) minimum, or the width of the approaching sidewalk if it is greater, to define a crosswalk area. Use special markings such as striped (zebra) longitudinal lines or diagonal crosshatching for added visibility and to emphasize a crossing. Use crosswalks at the corners of skewed intersections. Where warranted, the lighting levels in pedestrian areas should meet those recommended by the Illuminating Engineering Society (IES). Ensure that crossings have a smooth, even surface for people who use wheelchairs, walkers, or have other mobility impairments. Curb ramps at intersections are an important design feature which should be considered. Refer to lesson 8.6, “Design Requirements,” or lesson 9.3, “Basic Sidewalk Elements,” for more information about curb ramps. Lack of a flat landing area. Obstructions in or near the ramp. Severe counter slope at gutter. Water, ice, or debris at the toe of ramp. Ramps that are too narrow to accommodate wheelchairs. When new public walkways are built, the Americans with Disabilities Act (ADA) requires a curb ramp at each curbed street crossing. Ramps must also be added when roadways are repaired. A Pennsylvania court interpreted this requirement very broadly to include annual street resurfacing programs. (7) ADA also requires that curb ramps be installed in new development, annual programs, and capital projects. A transition plan should show how a community will systematically install curb ramps, especially at key locations like social service agencies and transit stops. The solution is to install curb ramps using ADA design guidelines. Curb ramps should be installed along with all new walkways. A program to retrofit existing walkways with curb ramps should be developed. Existing curb ramps should be inspected and replaced if they do not meet ADA guidelines. Having curb ramps installed at all intersections with sidewalks requires a clear, well–planned strategy that may require a period of several years to fully implement. Here are three keys to a successful implementation. Regulate new development and redevelopment. Make sure all permits involving walkways include curb ramps. Because this is required by ADA, it should not be hard to implement. Local ordinances may need changing, or where there is less formality, a simple directive might be issued. The same goes for bringing standard plans and specifications into compliance with ADA guidelines. Find out who reviews plans and issues permits. They may or may not be the same people. Educate them on ADA and local curb ramp requirements (location and design). This could involve developing typical layouts and designs, a special training session, or a presentation at a staff meeting. Follow up. Education is not a one–time effort—employees move on and new ones take their places. Periodic memos and presentations can keep everyone on track. Inspectors are key players. Involve them in each of the steps above. Capital projects and annual programs. ADA requires curb ramps to be installed whenever “alterations to existing transportation infrastructure” are made. In other words, all capital projects and annual programs must be scrutinized for opportunities to install new ramps to ensure that all new or rebuilt intersections conform to ADA requirements. This can include construction projects ranging from annual resurfacing programs to major signalization upgrades and street widening. Work with the managers of annual programs, such as asphalt resurfacing, to identify locations where curb ramps should be installed. Make sure curb ramps are written into all scope of work text and budgets for funding proposals and locally funded capital projects. As projects are funded and staff assigned, make sure the project manager knows where curb ramps must be included in the project. Have someone knowledgeable review designs to make sure well–designed curb ramps have been included. Encourage staff and constituents to identify locations where ramps are needed. Try distributing ramp request forms in the form of public request cards (see figure 11–3) to agencies and groups involved with the disabled community. Evaluate and respond quickly to returned ramp request forms. Curb ramps must be properly built. Even a 0.6–cm (0.25–inch) lip on a ramp can make it difficult, if not impossible, for some wheelchair users to negotiate it. It helps public relations to respond to ramp requests within a reasonable amount of time—less than six months. When using private contractors, it may make sense to bid some of the ramps on a per unit basis as opposed to a site–specific basis to allow for quickest response to citizen requests. Figure 11–3. Photo. Ramp request form used by the City of Seattle, WA, Engineering Department. Curb ramps typically cost between $500 and $1,000 each. Usually, it is cheaper to install a large number at the same time or as part of other concrete work. Timely ramp installation is a key part of an overall pedestrian program. Frequently, curb ramps can be installed easily and quickly, giving communities highly visible products that can improve locations all over town. With this in mind, it is preferable to design a curb ramp program to respond to citizen requests within six months. Where narrow sidewalks and limited rights–of–way exist, installation of curb ramps may take longer. In either case, consider using a public request card like the one shown above in figure 11–3 to bring curb ramp requests to the attention of the street or public works department. The city of Seattle, WA has developed an excellent program in this regard. Check to see if ramps are being built as required and designed. In the case of new developments, do occasional checkups to see if ramps are included in new plans. The same goes for annual programs. Seek out feedback on the location and design of ramps from local organizations that include wheelchair users. Maximum slope not to exceed 8.33 percent (1:12) is required. The width must be 0.9 m (3 ft) or greater. A maximum allowable cross slope is 2 percent (1:50) is required. Transition areas between a walkway and a ramp should be beveled 10 percent for 1.2–m (4–ft) ramps and 8.33 percent for ramps of less than 1.2 m (4 ft). Textured surfaces at curb ramps help identify crosswalk locations for visually impaired pedestrians (information on textured surfaces is included later in this lesson and previously in lesson 9, section 3). Refer to lesson 8.6, “Design Requirements,” or lesson 9.3, “Basic Sidewalk Elements,” for figures and further curb ramp design information. In some cases, simply installing a crosswalk is not enough to ensure pedestrian safety at a crossing. Therefore, several other treatments may be used in conjunction with crosswalks to improve safety and provide greater visibility of pedestrians to motorists. Pavement markings and signing (lesson 10.4–10.8). In–roadway warning lights (lesson 10.9, “ITS Technology”). Automated detection devices (lesson 10.9, “ITS Technology”). Street lighting (lesson 9.5, “Ambience, Shade, and Other Sidewalk Enhancements”). Pavement surfaces and tactile ground surface indicators (lesson 9.3, “Basic Sidewalk Elements”). 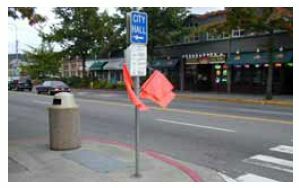 Description—Pedestrians select a flag from those posted on each side of the crosswalk, flag traffic to let drivers know they wish to cross, then return the flag to the holder on the opposite side of the street after crossing. Application—Crossings on higher–volume multilane roads. Cost (including labor)—$100 including holding racks per crossing. Figure 11–4. Photo. Flag treatment used in Kirkland, WA. Description—Pedestrian signs made of the FHWA–approved fluorescent yellow–green color are posted at crossings. Application—Pedestrian and bicycle crossings, including schools. Cost (including labor)—$200–$300 per sign. Figure 11–5. Photo. Fluorescent yellow–green sign treatment in Austin, TX. Description—Flashing amber lights are installed on overhead signs, signs in advance of the crosswalk, or signs located at the entrance to the crosswalk on pedestal poles. Cost (including labor)—$10,000–$40,000 per crossing, depending on placement. Figure 11–6. Photo. Flashing beacon treatment in Austin, TX. Description—Detectable warnings are a standardized surface feature composed of raised truncated domes, used to identify a change from pedestrian to vehicle use. Application—At the base of curb ramps and curb cuts adjacent to a crossing. Cost (including labor)—$200–$2000 per ramp or curb, depending on total area. Figure 11–7. Photo. Detectable warnings treatment in Roseville, CA. Description—Median islands and crosswalks laid out in a staggered configuration at uncontrolled intersections require pedestrians to walk toward traffic to reach the second half of the crosswalk. Application—Across multilane roads (applications at midblock locations will be discussed in lesson 12). Figure 11–8. Photo. 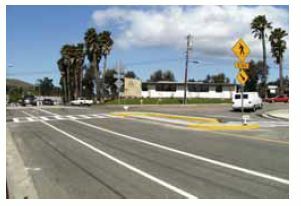 Staggered pedestrian crossings (Z–crossings) treatment in San Luis Obispo, CA. Pedestrians often have trouble crossing at unsignalized intersections along arterials. This is especially true for the elderly, whose eyesight and mobility may be poor, and for children, whose judgment may be questionable. And, while most motorists may be required to stop and yield to crossing pedestrians, few arterial street drivers will stop unless forced by, for example, traffic signals. In general, when the Pedestrian Volume Signal Warrant is met and a new traffic control signal is installed, pedestrian signal heads are installed along with the signal. Often, jurisdictions create their own policies for when to install pedestrian signal heads. Rather than follow the MUTCD standards (or in addition to following the standards), they may rely on other design features already in place in order to determine the need for a pedestrian signal head. For instance, a community may decide to install pedestrian signal heads at all locations with intersection curb ramps. Or they may have a policy that any new traffic signal installation will automatically include pedestrian signal heads. Where traffic volumes are high and pedestrian crossings frequent, the lack of signalized crossings makes pedestrians impatient. The result: jaywalking, unpredictable movements, and ultimately more pedestrian–traffic crashes. Yet if the intersecting side street is lightly traveled, it makes little sense to install a full traffic signal for vehicles. The solution is to install a pedestrian half–signal (see figure 11–9). A half–signal is a pedestrian actuated light that stops arterial traffic only, leaving the lower volume cross street unsignalized and controlled by Stop signs only. This allows pedestrians to cross safely upon demand without unnecessarily creating delays upon arterial street traffic that a fully signalized intersection might impose. Figure 11–9. Photo. Half–signal in Portland, OR. While a full signal might be an option, costs could easily be prohibitive. A fully signalized intersection can cost twice as much as a half–signal. If a signal on the residential street is unnecessary, the pedestrian half–signal can be an answer. Another way to accommodate pedestrians without unnecessarily impeding arterial traffic is to tie in a half–signal with full signals on either side. In this scenario, after a pedestrian pushes the call button, the WALK signal is displayed when it is tied in with the progression of adjacent signals. This method may be more attractive to transportation engineers who don’t want to impede traffic. Section 7 of the ITE Informational Report summarizes the use of different signals installed for pedestrian crossings. (8) Pedestrian signals can be applied to intersections where the pedestrian crossing is signalized but the intersection side street approaches are controlled by Stop signs. However, most applications of pedestrian signals in the United States are at midblock locations. These will be discussed in lesson 12. Create an annual program. If the need is great and local budgets can afford it, creating an annual half‑signal installation program is best. This approach helps staff learn to evaluate potential locations. It also helps institutionalize the logic behind the pedestrian half–signal. Identifying and prioritizing suitable locations is the key. Costs, however, can be high and may average from $50,000 to $100,000 per installation. Select suitable locations. Half–signal sites are often suggested by local schools, hospitals, social service offices, and senior citizen centers. These institutions typically generate a lot of pedestrian trips. If one is located across from a bus stop, for example, numerous daily crossings can be expected. Relatively low volume but difficult crossings used by children and the elderly may warrant half–signals. In such cases, common sense tempered by engineering judgment can substitute for numeric standards. Junctions of heavily used bicycle/pedestrian trails and high–volume arterials are also good candidates. 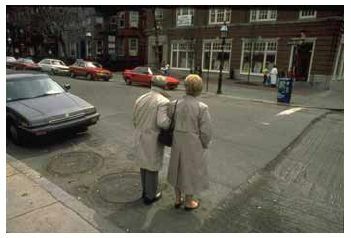 Citizens, particularly the elderly, can help identify difficult intersections. Follow up their requests and complaints with onsite staff evaluations. If an intersection looks promising, conduct a detailed analysis. List the best candidate locations and prioritize based on crash histories, traffic speeds, pedestrian volumes, and characteristics. Focus on environment mitigation. Your jurisdiction might require half–signals as a condition of development. If a given development is likely to create a pedestrian crossing problem, requiring mitigation makes sense. This approach demands clear warrants for when pedestrian half–signals are necessary to justify assessing developers the cost of traffic impacts. Issuing permits can thus be linked to half–signal installation. Pedestrian half–signals cost anywhere from one quarter to one half of a full intersection signalization, depending upon the intersection. Because they are costly, it may not be feasible to install more than a few each year. In many respects, it is easy to evaluate the success of a pedestrian half–signal. If the number of crashes and/or pedestrian complaints goes down, then it’s a success. If the arterial has high volumes, study traffic impacts such as the frequency of motorist delays. If frequent red phases cause delays, consider lengthening the green phase a bit. To strike the right balance, observe the intersection throughout the day and, if necessary, vary the timing. When traffic volumes on the intersecting street are less than 50 percent of MUTCD–recommended benchmarks. When a substantial amount of traffic might be expected to opt for and use lower–volume parallel streets in order to avoid a full signal placed along the arterial. Because signals and their impacts are often controversial and politically sensitive, creating a flexible warrant may be appropriate, especially given the lack of MUTCD guidelines. Walking across a wide street takes longer than crossing a narrow street. As a result, pedestrians are exposed for a longer period of time to the threat of being hit by a vehicle when they cross a wide street. Another problem pedestrians face when trying to cross a street is visibility. Parked cars may make it difficult for them to see oncoming vehicles and vice versa. Also, when streets intersect at an acute or obtuse angle, or have a large curb radius, motorists can make turns at relatively high speeds. By contrast, 90–degree intersections and corners with tight curb radii tend to slow motorists down. The problem with obtuse angles is particularly bad when a vehicle on an arterial street turns onto a residential street. Pedestrians crossing the residential street adjacent to the arterial may not expect high–speed turning traffic or they may have their backs turned toward the turning cars. The solution is to shorten the crossing distance for pedestrians. One way to effectively shorten the pedestrian crossing distance on streets where parking is permitted is to install curb extensions, also known as bulb–outs, chokers, neck–downs, or flares. Curb extensions project into the street, usually for a distance equal to the depth of a typical parallel parking space, making it easier for pedestrians to see approaching traffic and giving motorists a better view of pedestrians (see figure 11–10). When motorists are better able to see pedestrians, they have a greater opportunity to stop before a crash can occur. At signalized intersections, it decreases the length of the pedestrian phase, thereby increasing the main street green time and thus more vehicle throughput and less driver delay. At unsignalized intersections, it reduces the time a right– or left–turning vehicle has to wait for a pedestrian to cross before exiting the roadway. When designing curb extensions at intersections where there is low truck traffic, consider making the corner radius as small as possible. This will have the effect of slowing down right–turning motor vehicles. Where truck traffic is present, a tight corner radius may make the turn difficult to negotiate for these vehicles. Furthermore, the constant overriding of the curb and sidewalk by rear wheels of trucks may ultimately cause damage to the curb or sidewalk or cause injury to pedestrians. Figure 11–10. Photos. Curb extensions reduce crossing distances for pedestrians and provide additional corner storage space. Simultaneously installing curb extensions and changing curb radii is frequently possible since both involve moving the curb and gutter into the improved portion of the street right–of–way. Adding bollards to make the corner more visible may be an alternative solution. 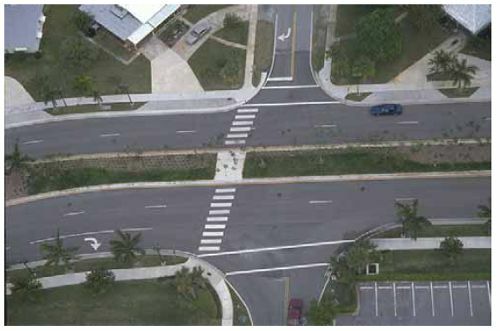 Where acute or obtuse intersections are encountered, such as where a residential street meets an arterial, creating an intersection that is closer to 90 degrees may also provide opportunities to reduce curb radii and create curb extensions (see figure 11–11). Figure 11–11. Illustration. Curb extensions improve the visibility of pedestrians by motorists and vice versa. Determine arterial and residential street specifications. Include curb extensions and/or smaller curb radii in standard plans and specifications for public and private road projects. A change in one or more local ordinances may be required or specifications may sometimes be implemented by administrative rule. Locations where residential streets meet arterial streets at an obtuse angle. Locations that are on routes used by schoolchildren or the elderly. Downtown or neighborhood shopping areas with high pedestrian volumes. Projects nominated by neighborhood associations. The cost of installing curb extensions and changing curb radii can vary considerably, depending on whether drain grates have to be moved and/or whether other issues must be addressed. For example, it may be necessary to move the conduit for a signal or relocate utility poles and light and/or sign standards. Decide if the work is to be done by the public works department or a private contractor. In general, if only a few curb extensions are involved, it may be less expensive and faster to have town or city crews do the work. If there is a lot of work to be done, it may be less expensive to use a private contractor. The key is to let the public know how long it will take to install a curb extension and then deliver promptly. Visit project sites to determine if good locations have been selected and the best design(s) is being used. Check crash records, do speed studies of cars making turns, look at the curbs to see if trucks or buses are driving over them, and ask pedestrians if they feel safer. Be a good listener and observer, and make modifications where needed. On arterial streets, install curb extensions only where permanent parallel parking is next to the curb. Curb extensions should protrude a minimum of 1.8 m (6 ft) into the roadway. Ideally, they should project the full depth of adjacent parking stalls, usually 2.4 to 2.7 m (8 to 9 ft). Curb extension projections prevent the parking area next to the curb from becoming a travel lane. A curb radius of 3.0 to 4.6 m (10 to 15 ft) should be used where residential streets intersect other residential streets and arterial streets. A curb radius of 6.1 m (20 ft) should be used at the intersections of arterial streets that are not bus or truck routes. A curb radius of 7.6 to 9.1 m (25 to 30 ft) should be used at the intersections of arterial streets that are bus and/or truck routes. Curb extensions should not extend so far into the street that they present a bottleneck for bicycle travel. As a minimum, a 4.3–m (14–ft) travel lane should be maintained. The public is often baffled by pedestrian signal timing and pushbuttons; such pedestrian features seem to vary not only from jurisdiction to jurisdiction, but also from intersection to intersection. WALK/DON’T WALK timing lengths often appear arbitrary—especially the WALK and flashing DON’T WALK phases. Part of the problem stems from the fact that many walkers do not know that the flashing DON’T WALK is intentionally displayed before an average person can completely cross the street. Another part of the problem may result from timing cycles that are simply too fast for slow walkers such as older pedestrians or persons with disabilities. Another aspect of the problem may be due to the absence of pedestrian pushbuttons or because a call button is obscured or difficult to reach (see figure 11–12). At many intersections that do have pushbuttons, the DON’T WALK phase is so long that pedestrians feel their pushbutton request has not been recognized by the signal system. All of these problems encourage disrespect for pedestrian signals, promote increased jaywalking, and create conflicts with motorists. Figure 11–12. Photo. Example of obscure pedestrian pushbuttons; pushbuttons should be conveniently placed and clear from obstacles. Develop policies governing pedestrian signal timing and pushbutton actuation to ensure fair treatment for pedestrians. Make signal timing as consistent as possible, and adopt a clear pedestrian pushbutton warrant. Develop a desired level of service (LOS) for pedestrian waiting and pushbutton response times and evaluate signalized intersections to see if the pedestrian LOS at signalized intersection falls within an acceptable range. Seemingly arbitrary length of WALK and flashing DON’T WALK cycles. Pros and cons of lengthening flashing DON’T WALK to accommodate slower pedestrians. Safety tradeoff of shortened pedestrian phase implemented to enhance vehicular right turns. Fairness of laws that allow motorists to enter an intersection on the yellow while prohibiting pedestrians from doing so during flashing DON’T WALK. Tradeoff between motor traffic delays and pedestrian delays at actuated pedestrian crossings. Integration of pedestrian recall and pedestrian actuation in way pedestrians will understand. Making signalized intersections consistent with stated policies won’t happen overnight; consider it as part of a long–term commitment to pedestrian safety. Whatever strategy is employed, use field observations to see how pedestrians react to signal timing and pushbuttons. Comparing a variety of configurations will help. It is possible for workable and consistent policies to be developed. Annual program. A comprehensive program should be established to evaluate and prioritize improvements. It should not be hard to locate those areas needing attention. In all likelihood, the public works department probably maintains a file filled with complaints from citizens. New signal or signal timing projects. 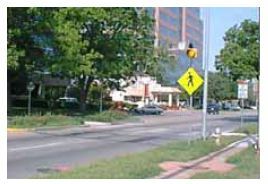 Review the pedestrian signal timing plan for any intersections undergoing signal modification or adjustments. Keep aware of signal work, providing appropriate suggestions. This will help signal engineers become more sensitive to pedestrian needs. The peculiarities of many intersections mean that a strictly policy–driven approach may not be possible. As a result, trained personnel will be needed to evaluate signal timing and actuation at many specific locations. Most of the work will be done by agency crews unless there is a large enough backlog to justify going out to bid. Monitor intersections with modified signal timing and pushbuttons, and compare them with unaltered intersections. Crash reductions and/or fewer pedestrian complaints will be good indicators of whether the new policies are working. Develop an LOS for pedestrian pushbuttons and apply accordingly. Signals must fulfill a need, gain attention, convey a clear and simple meaning, and command the respect of road users, as well as provide adequate time for response (see figure 11–13). Figure 11–13. Illustration. Pedestrian crossing signals should be clear and understandable by all users. Average walking speed has been calculated at 1.2 m (4 ft) per second (s) ; 1.1 m /s(3.5 ft/s) is becoming more common; 0.9 m/s (3 ft/s) should be used where there is a high frequency of older pedestrians; and people with mobility impairments move as slow as 0.8 m/s (2.5 ft/s). Some signal devices can provide additional time, if required, often by depressing the pushbutton for a specified period of time. Many pedestrians stop watching for lights and instead look for gaps to cross streets when their delay exceeds 30 seconds. Consider using leading pedestrian interval (LPI) to give pedestrians an advance walk signal before the motorists get a green light, thus giving the pedestrian several seconds to start into the crosswalk where there is a concurrent signal. Place pedestrian signal heads at each end of the crosswalk. Place the pushbutton at the top of and as near as possible to the curb ramp and clearly in line with the direction of travel. This will improve operations since many pedestrians push all buttons to ensure that they hit the correct one (see figure 11–14). Pedestrian pushbuttons are often provided at locations with intermittent pedestrian volumes to call for the walk message and/or extend the crossing interval. Figure 11–14. Photo. 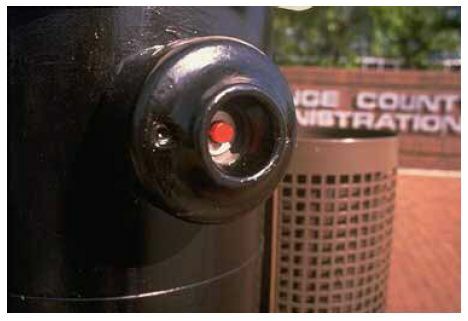 Example of pedestrian pushbutton location. Use a pushbutton box that gives pedestrians a visible acknowledgment (indicator light comes on at pushbutton box) that their crossing request has been received. Where medians exist, place additional pushbuttons in medians. If signal head on opposite side of the street is more than 18.3 m (60 ft) away, place additional pedestrian signal heads in medians. Place pedestrian signals in channelized islands. Visually impaired people need audio support at key signalized intersections. Audio signals are available that use different sounds—from pleasant (cuckoo or tinkling bell sounds preferred) to obnoxious (avoid raspy sounding buzzers). Potentially use a leading pedestrian interval that allows pedestrians a head start at getting into the crosswalk and makes them more visible to motorists. For the WALK phase, allow time for pedestrians to look around and start walking. For coordinated signal systems, extend to full green time minus flashing. For the DON’T WALK phase (pedestrian clearance interval), avoid shortening the WALK phase to improve the flow of right–turning vehicles. The flashing DON’T WALK phase (pedestrian clearance interval) should be included in the full green time. This is calculated as part of the crossing time. Crossing time equals distance divided by 0.8 to 1.2 m/s (2.5 to 4.0 ft/s), depending on the customer base. For the steady DON’T WALK phase, allow equal time for the yellow clearance and the all–red signal. Pedestrians should be out of the street. MUTCD has many suggestions regarding pushbutton placement and pedestrian signal timing. In many other areas of pedestrian activity, however, it leaves a great deal to engineering judgment. Pedestrian refuge islands are defined as the areas within an intersection or between lanes of traffic where pedestrians may safely wait until vehicular traffic clears, allowing them to cross a street. Refuge islands are commonly found along wide, multilane streets where adequate pedestrian crossing time could not be provided without adversely affecting the traffic flow. These islands provide a resting area for pedestrians, particularly those who use wheelchairs, elderly, or otherwise unable to completely cross an intersection within the provided signal time. These refuge islands also provide a safety area for pedestrians caught in the street when a signal changes. Figure 11–15. Photo. Streets with raised medians usually have lower pedestrian crash rates. Wide, two–way streets (four lanes or more) with high traffic volumes, high travel speeds, and large pedestrian volumes. Wide streets where the elderly, people with disabilities, and children cross regularly. Streets with insufficient green signal phasing time for safe pedestrian crossings. Wide, two–way intersections with high traffic volumes and significant numbers of crossing pedestrians. Low–volume side–street traffic demands with insufficient green time to cross—low side–street volumes in combination with high main street volumes may warrant short green times for the side street, which, in turn, does not allow enough time for the pedestrian to cross the entire street. Narrow streets and/or streets where substandard–width refuge islands are used. Instances in which a high turning volume of large trucks exist. Where space is needed more for sidewalks. Conditions under which the roadway alignment obscures the island, thereby making it likely that vehicles will drive onto the island. Areas where the presence of a safety island will severely hamper snowplowing. Reducing pedestrian crossing time by splitting crossing distances (i.e., providing staged crossing of pedestrians), thereby reducing the green time required for the pedestrian crossing phase. Providing pedestrians with a resting place when crossing wide roads or intersections (see figure 11‑16). Providing a pedestrian storage area. Increasing the capacity of the intersection with a near–side island that provides a better location for the stop bar. Loading and unloading transit riders (although curbside locations provide a better alternative). Providing a location for traffic control (shorter mast arms) and utility pole installations. Figure 11–16. Photo. Refuge islands provide pedestrians with a resting place when crossing roads or intersections. A false sense of security or safety to pedestrians. Street sweeping or snowplowing problems. Damage to vehicles if struck. Pedestrian refuge islands may be installed at intersections or midblock locations as deemed appropriate by engineering studies. Refuge islands should be considered during the design of complex intersections or streets rather than after construction has been completed. They must be visible to motorists at all times and should be delineated by curbs, guideposts, signs, or other treatments. Refuge islands should be designed to minimize the potential hazard to motorists and pedestrians alike. Areas at traffic signals where the total length of crosswalk cannot be readily traveled in one pedestrian phase. Special consideration should be given to intersections where a large number of elderly pedestrians and/or people with disabilities will be present. Special consideration should also be given to complex or irregularly shaped intersections where islands could provide a pedestrian with the opportunity to rest and become oriented to the flow of oncoming traffic. 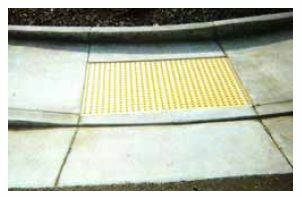 Raised curbs with cut–through ramps at pavement level or curb ramps for wheelchair users. Cut–through ramps should be graded to drain quickly and should also have detectable warning (truncated domes, colored pavement, etc.) to identify the refuge island. Islands with ramps should have a level area at least 1.8 m (6 ft) long at the same level as the top of the raised median to provide a level area for wheelchair users. Areas at least 1.8 m (6 ft) wide from the face of the curb to the face of the curb. The minimum width should not be less than 1.2 m (4 ft) wide from the face of the curb to the face of the curb. The island should not be less than 3.6 m (12 ft) long or the width of the crosswalk, whichever is greater. The minimum island size should be 4.6 square meters (m2) (50 square feet (ft2)). An approach nose, offset from the edge of the traffic lane, appropriately treated to provide motorists with sufficient warning of the island’s presence. This can be achieved in various ways such as illumination, reflectorization, marking, signage, and/or size. Pedestrian pushbuttons and signage adjacent to crosswalks, one for each crossing, with a minimum separation of 3 m (10 ft). Detectable warnings for the visually impaired. Placement on wide (four lanes or more) streets with high traffic volumes. No obstruction to visibility by such features as foliage, barriers, or benches. Barriers that may be necessary to keep pedestrians from stepping into traffic at improper locations. A modern roundabout is built with a large, often circular, raised island located at the intersection of an arterial street with one or more crossing roadways and may take the place of a traffic signal. Traffic maneuvers around the circle in a counterclockwise direction, and then turns onto the desired street. All traffic yields to motorists in the roundabout and left–turn movements are eliminated. Unlike a typical intersection, vehicles generally flow and merge through the roundabout from each approaching street without having to stop. Roundabouts need to accommodate pedestrians and bicyclists. It is important that automobile traffic yields to pedestrians crossing the roundabout. Splitter islands at the approaches slow vehicles and allow pedestrians to cross one traffic lane at a time. Single‑lane approaches can be designed to keep speeds down to safer levels and allow pedestrians to cross. Multilane approaches have higher speeds, create multiple threats for pedestrians, and are not recommended. Lowering vehicular speeds. This allows more time for drivers to react to potential conflicts and reduces the pedestrian’s risk of death if hit by a motor vehicle. Reducing conflict points. This eliminates the potential for hazardous conflicts, in contrast to an intersection (see figures 11–17 and 11–18). Conflicting vehicles come from a more defined path at roundabouts, and thus pedestrians have fewer places to check for conflicting vehicles. Table 11–2. Roundabout trade–off issues for pedestrians. Shorter crossing distances—There are generally fewer lanes to cross in a roundabout, and many crossings are broken by pedestrian refuge islands. Out–of–direction travel—Roundabouts may be inconvenient for pedestrians because the crosswalks are set back farther from the intersection and the distance pedestrians have to travel is longer. Decreased waiting time—Pedestrians do not need to wait for a long traffic signal cycle before they can cross the roadway. Visually impaired pedestrians—Visually impaired pedestrians who use audible cues from the traffic movements in order to judge when it is safe to cross find fewer cues to negotiate a roundabout. Figure 11–17. Illustration. Intersections have 16 vehicle/pedestrian conflict points. Figure 11–18. Illustration. Roundabouts have eight vehicle/pedestrian conflict points. All–way stop–controlled intersections may be preferred by pedestrians with visual impairment because vehicles are required to stop before they enter the intersection. However, crossing the exit leg of an all–way stop–controlled intersection can be intimidating for a pedestrian since traffic may be turning onto the exit from multiple directions. Roundabouts, on the other hand, allow pedestrians to cross one direction of traffic at a time; however, traffic may be moving (even if at a slow speed), thus making it more challenging to judge gaps, especially for visually impaired users, children, and the elderly. Elderly pedestrians, children, and pedestrians who have vision loss find it more difficult to cross unprotected road crossings. These pedestrians generally prefer larger gaps in the traffic stream, and walk at slower speeds or start later than other pedestrians. Multilane roadways entering and exiting double–lane roundabouts require additional cues to cross, since pedestrians need assurance that they have been seen by drivers in each lane they are crossing. When crossing a roundabout, there are several areas of difficulty for the blind and/or visually impaired pedestrian. It is expected that a visually impaired pedestrian with good travel skills must be able to arrive at an unfamiliar intersection and cross it with pre–existing skills and without special, intersection–specific training. Roundabouts pose problems at several points of the crossing experience, from the perspective of information access. Vision impaired pedestrians may have difficulty navigating and identifying appropriate gaps at roundabout crossings because circulating traffic masks the sounds needed to identify a gap in the traffic to make a safe crossing. Crosswalks at roundabouts can be a tricky design issue. Unlike an intersection, by vehicle code definitions there cannot be a legal unmarked crosswalk at a roundabout. A legal crosswalk at a roundabout must be marked. (11) However, many State guidelines recommend not painting pedestrian crossing lines across the entrances and exits of roundabouts because they could give pedestrians a false sense of security when crossing the roadway. Instead, they recommend encouraging pedestrians to identify gaps in traffic and cross when acceptable gaps are available. There is a high proportion of young, elderly, or infirm citizens wanting to cross the road. Pedestrians are experiencing particular difficulty in crossing and being delayed excessively. Most guidelines recommend the location of a crosswalk at 1 to 2 car lengths from the yield line [or] 6.1 to 10 m (20 to 33 ft). This will reduce decisionmaking problems for drivers and avoid [a] backup queue of vehicles waiting to exit roundabouts. The ideal solution would be to have all pedestrians follow the path created for them and to have all motorists yield to them. But in moving pedestrians too far from the roundabout, pedestrians will not tolerate the out–of–direction travel created. If the crosswalks are too close to the yield line, motorists will stop on it. Therefore, the best solution is to place the crosswalk behind a stopped car, about 4.0 to 5.0 m (13 to 16.5 ft) from the entry point. This is not an ideal solution, as one cannot force pedestrians to make even this slight a detour, and when a bus or truck is stopped, it will cover the crosswalk. Shorten the crossing distance compared to locations adjacent to the inscribed circle. Separate vehicle–vehicle and vehicle–pedestrian conflict points. Allow the second entering driver to devote full attention to crossing pedestrians while waiting for the driver ahead to enter the circulatory roadway. There should be a cut–through in the splitter island with a minimum width of 2.0 m (6.6 ft). (12) If this can’t be accomplished, a raised island as narrow as 0.8 m (2.5 ft) is still preferred over a painted line alone. Determine that street widths and/or available right–of–way are sufficient at the location to accommodate a properly designed roundabout. Reduce vehicle approach speed (to 24.1 to 29.0 km/h (15 to18 mi/h)) by providing adequate deflection on each approach. Design splitter islands as large as the site allows. Prohibit parking on the approaches of the roundabouts to provide clear visibility. Provide street lighting to illuminate not only the circulating roadway but also the approaches. Locate signs and plants so as not to obscure pedestrians. Understand that roundabouts are generally not appropriate for multilane road intersections. Plan roundabouts for locations with high percentages of left–turning traffic. Additional research is needed to determine the best way for visually impaired pedestrians to safely cross roundabouts. To this end, NCHRP has funded a significant research effort (Project 3–78) to develop crossing solutions at roundabouts and channelized turn lanes for pedestrians with vision disabilities. NCHRP Project 3–78 was scheduled to begin in late 2004. Look at research on roundabouts and the visually impaired and develop geometric designs or other approaches that will make roundabouts more user friendly for pedestrians who are visually impaired and don’t employ visual cues to identify gaps in the traffic stream. The need to develop and detail pedestrian intersection improvements in a manner that can be constructed within the normal field of highway construction is an extremely important issue. Pedestrian accommodations at intersections include both traffic signal and pavement marking improvements. An exercise covering pavement marking issues was previously addressed in exercise 10.10. 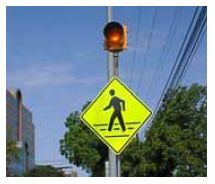 With regard to signalization at intersections, pedestrian improvements typically include pedestrian signals, pedestrian pushbuttons, conduit/wiring, mounting brackets, and pedestrian poles. Traffic signal improvements are specified through a detailed system of standard drawings, specifications, and bid item numbers. An example plan view drawing demonstrating this method for specifying traffic signal improvements using Georgia Department of Transportation (GDOT) standards is provided for reference in figure 11–19. Figure 11–19. Illustration. Example traffic signal plan, Superior Parkway construction plans, Lawrenceville, GA.
Plan view drawing of local intersection. MUTCD, FHWA, Washington, DC, 2003, available online at http://mutcd.fhwa.dot.gov, accessed April 22, 2004. Guide for the Planning, Design, and Operation of Pedestrian Facilities, American Association of State Highway and Transportation Officials, Washington, DC, July 2004. 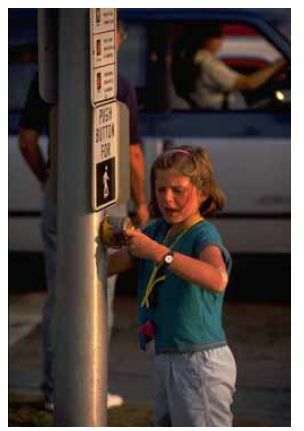 Design and Safety of Pedestrian Facilities—A Recommended Practice of the Institute of Transportation Engineers, Institute of Transportation Engineers, Washington, DC, 1998, available online at http://safety.fhwa.dot.gov/ped_bike/docs/designsafety.pdf. Implementing Pedestrian Improvements at the Local Level, Federal Highway Administration, Publication No. FHWA–98–138, Washington, DC, 1998, available online at http://safety.fhwa.dot.gov/ped_bike/docs/localpedguide.pdf. Oregon Bicycle and Pedestrian Plan: An Element of the Oregon Transportation Plan, Oregon Department of Transportation, 1995. Vermont Statutes Online, http://www.leg.state.vt.us/statutes/statutes2.htm, accessed August 12, 2005. KINNEY v. YERUSALEM, No. 93–1168, available online at http://www.usdoj.gov/crt/foia/pa2.txt, accessed August 12, 2005. Lalani, N., “Alternative Treatments for At–Grade Pedestrian Crossings,” Informational Report, Pedestrian and Bicycle Task Force, Institute of Transportation Engineers, Washington, DC, 2001. Planning and Implementing Pedestrian Facilities in Suburban and Developing Rural Areas, NCHRP Report 294A, National Cooperative Highway Research Program, Transportation Research Board, Washington, DC, June 1987. “A Comparison of the Pedestrian Safety of Median Islands and Marked Crossings,” Western Roads, Western Australia, August 1978. Zegeer, C.V., C. Seiderman, P. Lagerwey, M. Cynecki, M. Ronkin, and R. Schneider, Pedestrian Facilities Users Guide—Providing Safety and Mobility, Publication No. FHWA–RD–01–102, Federal Highway Administration, McLean, VA, March 2002. Taekratok, T., Modern Roundabouts for Oregon, Publication No. 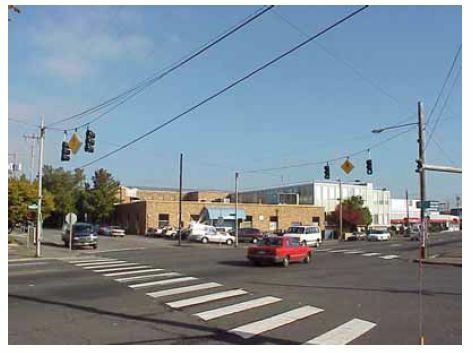 OR–RD–98–17, Oregon Department of Transportation, Salem, OR, June 1998, available online at http://www.odot.state.or.us/techserv/engineer/pdu/Modern%2520Roundabouts.pdf, accessed March 23, 2004. Robinson, B.W., L. Rodegerdts, W. Scarborough, W. Kittleson, et al., Roundabouts: An Informational Guide, Publication No. FHWA–RD–00–067, Federal Highway Administration, McLean, VA, June 2002, available online at http://www.tfhrc.gov/safety/00068.htm, accessed March 24, 2004. 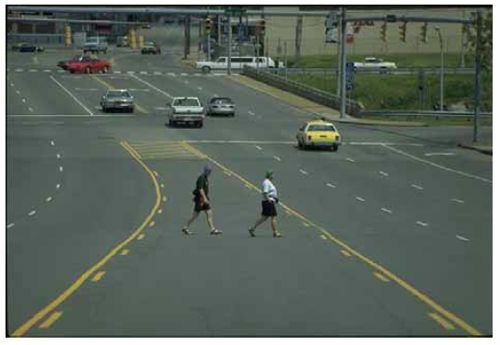 Pedestrian Access to Modern Roundabouts: Design and Operational Issues for Pedestrians who are Blind, August 2003, available online at http://www.access–board.gov/research&training/roundabouts/bulletin.htm.